Monday: Morning spinning class at West Kirby, Barbara reported a full class last night. It must be people trying to work christmas off. This one had about 8 in it. Gym next, weight machines and then 500 calories on the crosstrainer. This took 3 seconds under 45 minutes and was really boring and I started mucking around with power levels. 150 watts on level 11 got upped to 200 watts on level 14 out of 25. I don’t know what the woman on the machine next to me got out of her session but level 1 had the wattage at 39. I tried level 1 at the end and it’s a complete waste of time. 2 Km on the Concept 2 rowing machine with a drag factor of 88 took 8 mins 37 seconds which is steady going. The 500m/split time that it shows allows you to alter your technique as faster is not always the most efficient. Another set of weights then the shower and home. Aldi had no sandwiches so I left empty handed. Tuesday: Still the wrong side of 88 kg mostly due to a plentiful supply of chocolates in the house and no willpower on my part among other things. Morning spinning class at West Kirby then the gym again. Much the same weight routine that wants a bit of looking at and ran another proverbial mile. Started of at 9km/hr and upped it for the final 0.5 km to 10.5 km/hr. 148 kCals. As all the machines were occupied I had a go on an exercise bike. I normally wouldn’t touch these with a barge pole as they are mostly used as seats to watch the TV. I’d set the time to 15 minutes and set the level to 13 which at a cadence of 80 rpm was 240 Watts. I couldn’t maintain this for 15 minutes so backed it off after 5 minutes, recovered for 4 minutes at 100 Watts which is 100rpm at level 5. Adjusted the seat up a notch then spent the remainder of the time using Lances high cadence technique. 100 rpm at level 11 is about 250 Watts and it did feel better, near the end of the session I upped the level to 14 with the power shooting up to 300 Watts. Average power was 196 Watts and it felt like it, I had to get a paper towel to wipe bike and the floor. Shower and home for a SIS Rego recovery drink. It’s the first time I’ve tried one and the 50g sachet has 29g of protein in it. Spent the afternoon blogging, twittering and sorting out the heartrate monitors. Found the Forerunner 50 box at the back of the cycle gear cupboard. I soon realised how much Discovery Channel stuff I have, like George Hincapies 2005 race shirt with radio pocket, and his shorts. Steve Cummings’s skinsuit plus a winter jersey along with a mountain of other stuff like the Lance 7 stars kit. A battery or two later I found out I’d been using the wrong strap with the wrong HRM. Now with a working HRM that measured calories it was off to the last spinning class of the year. I’d phoned up for a bike and was told just turn up there are plenty. This was a bit of an understatement. I’m first there turning up 15 minutes early, Barbara turned up and so did another two and that was it. A class of 3 to see the year out. Mind you it was -3 Deg C outside. No fan tonight for obvious reasons, reset the watch at the start and off we went all 3 of us. A squash court is a pretty bleak place to spin but it’s even bleaker when the lights go out as there is no one in the class to keep the infra red sensor alive. The stats: 550 kCals with a dicky cheststrap. It doesn’t count heart rate in a timetrial tuck. Average heart rate 138 BPM including it stopping a couple of times. Doesn’t look good for tomorrow. Probably a short ride to the Eureka and back and look back on the year. Wednesday: Lie in, under 90 kg so yesterdays effort was worth it. Been crazy two weeks off work with the weight going on daily despite rides, spinning classes and gym sessions. Putting the Tacx away for Christmas didn’t help. Picked up the comic from Tesco along with Cycling Plus. Now I’d popped into Halfords the other day and saw the Boardman £999 carbon bike. I had a double take on the price and gave it the carbon flick of the index finger test. Carbon sounds dull, aluminum rings, steel hurts I reckon. It was they’re usual good review and it came top in most sections if not all. If your wanting a Carbon bike this is the one. C+ have been shouting Focus Cayo praises for a while but the Boardman bike beats it hands down in this review. When I was looking at this sort of bike they were twice the price, if it had mudguard eyelets I’d buy it as a winter Trainer. Never mind how hard things you think are going to get, get yourself a carbon bike for under a grand, get out there and give it you’re best. Thursday: Not the best of days, a lie in came up with a car that had been left with a parking light on for half of a day and no chance of starting it. Two decent length extension leads and a battery charger meant a restart in the dark. Luckily it fired up OK but not without the radiaor fan staying on and the power steering not working. A two hour drive had the battery charged up I hope. Went for a mile walk to check out a 305 problem. Friday: Off out to the Oval, give the gym a try out. Over a year after it closed for a pool upgrade not much has changed. The gym looks like it’s had a coat of paint and that’s about it. The machines are the same Preccor machines which aren’t that bad once you select a progam. Had half an hour on the crosstrainer on a cross country program was 400 calories worth, weight machines followed by a 30 minute session on a Concept 2 rowing machine that had me doing 6300 metres at a steady pace. After that it was a 15 minute run on the treadmill aerobic interval program. Not sure what was meant to happen on this when I started but the machine started to increase the gradient according to the profile. 8km/hr is hard work on a 9% gradient, then it drops to 6% then 0% then repeats. Going back to the same machines I started on after a year break revealed just how much form I’ve lost. There is an assisted dip/chin up machine and I was totally useless at it today. The gyms I’ve been using for the past year haven’t got room for the full range of machines and I’ve taken it too easy. To finish things off it was 30 minutes on the exercise bike. Intervals on this program, 2minute on 1 minute rest. Cadence, the aim was to maintain a cadence of 100 rpm as I slip back into 70 rpm mode when on a ride. 100 rpm at level 10 equates to 240 Watts and is hard to sustain for 2 minutes. The machine has a fatburn/aerobic/dangerzone LED bargraph and feeding in my details has it turn red at 145 bpm. So it is in the redzone for every interval. For the last interval I’d up the level a couple of steps and the power shot up to 360 odd Watts. Heartrate shot up to 172 bpm too with that I was done. I was in there about 2 1/2 hours which is a long time, there was a few people coming in to check the facilities probably with a new years resolution to keep. This little lot was 1650 calories on the HRM and it did tally with the calorie counting on the machines. My brother Andy rang up about his 705 and what to do next. A 705 doesn’t come with any software that actually makes the thing a useful device. Even the manual is a pdf on a CD. Thai meal over the road which was good again. Just started following Alberto Contador on Twitter. Some goods pics from Lance in Hawaii. Saturday: Late start to the day. Rode to the Eureka for breakfast. Rode back with Dave the scenic route Puddington, Burton Denhall lane, and Parkgate. 16.7 miles. Looks like the altimeter is playing up on the 705as mine was showing a gradient of 200% on Denhall lane which is 8% max. After yesterdays gym session I’d have to treat this as a recovery day. Sunday: Should have been a Northend training ride. Missed the easier run as it was still dark at 9 and may have made the 9:30 run but would have got battered by clubs big hitters. It’s bloody freezing by the way and the place is packed. Liverpool Century are there doing speed trials. I witness the CTC setting off to Delamere in the snow. I opt to call it a day and return home as I have no wet weather gear. Snow flurries on the way home via the scenic route. 16 bloody cold miles. This later turned to rain and I would have been in deep trouble even if I went out with the CTC to Delamere. Off out to Birkenhead to get some thermals. Marks had a pair but not the Merino wool ones that got swept off the shelves. Cheshire Oaks faired a lot worse but at least I picked up some cycling mags in Smiths. Todays Times was a tale of two cyclists, Rebbeca Rommero interviewed by Paul Kimmage was in sharp contrast to the Nicole Cooke article in Ingear. The Kimmage interview was laboured and covered the same ground as most of the previous interviews about ditching rowing etc. Nicole rides for Halford’s but Rebbeca is still unsponsored. Given that Chris Hoy is on TV every 15 minutes it seems a bit unfair. Good article in Cycle Sport about Steve Cummings and Italy. Mixed start to the year, it could have been better but a lot worse. Dakar rally which this year is in Argentina. A continent away from Africa and it seems to have lost a lot of it’s magic. GarminConnect is a web based application where Edge 605/705 and Forerunner owners can upload there rides and runs to store and view. At the moment you cannot export Courses like you can on MotionBased. The first release of GarminConnect was pretty dire compared to MotionBased. Fortunately things are looking up. The latest release includes Wikipedia entries and pictures of landmarks. While most of the performance data is there, there is also now links to the social networks too. This will come at a price later when it is fully functional. I’ve a lot of data on GarminConnect, mainly spinning classes and 705 rides as it doesn’t like the 305 yet. Once you’ve got the amount of data I’ve been collecting it becomes extremely valuable to you. You can now export links to your activities and play them on the Player that is built into it. The one thing you can’t do yet is download other peoples Courses or your own uploaded Courses to ride again. The site relies on Garmin communicator to upload your history to the site. The Forerunner series use the ANT link to wirelessly connect with the watches. The service is free at the moment and but I’ve been told a connect + service will be forthcoming. As a paying Motionbased customer I’ll be upgraded to it as Motionbased is phased out. An emergency charger for phones available in the UK from Maplin for a discount price of £3.00 . Comes with a bag to tie to the handlebars so you can recharge on the move. I’ve tried it a couple of time but not in anger as a 705 has a 15 hour battery life. I’ll post pictures when I can get around to it. The charger uses DC/DC conversion to get blood out of a stone. This is the only way to get 5 volts from a 1.2 or 1.5 volt single cell. Under test it gave 5.4 volts from a 1.2 volt LI/Mh 2500 mA single cell. The unit gets warm and one cell should get you about half a charge of a Garmin Edge 705. Recharging isn’t an instantaneous act, it takes time. This is why it has to be done on the bike. USB power is rated at 500 mA max @ 5 volts. Plugging it all into your Edge with a decent battery in the Chamelion will result in the charge Icon lighting up on your Edge. It helps to shut your Edge down to help with the recharging otherwise you maybe powering only the backlight which is power hungry. I’ve written other posts about USB chargers but this gives you the oportunity to buy something that works for the electrically challenged at a bargain price. If you store it with a battery in it the LED in the other end can lead to the battery getting discharged accidentally. Two AA cells in the bag should see you OK.
Moi on the Brimstage Time Trial , originally uploaded by Frank Kinlan. 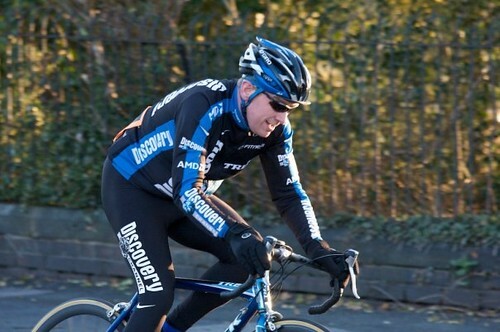 Just receive this picture of me on the Brimstage Time Trial this year. Thanks for the picture Tempo. Monday: Work, last day. Four off to look forward to. No gym. Tuesday: Morning spinning class at West Kirby followed by the Gym. Garmin Forerunner 50 threw its hand in and reset itself. Found it missing a screw and the strap wants replacing. Should have stayed for the second class as I wasn’t up to much in the gym. Tacx Giant of Provence DVD waiting for me when I got back, even the box reckons this is a challenge for well trained cyclists. I’m off out to buy a bigger fan. This proved to more difficult than it would seem, none of the shops have them as we are in the middle of bloody winter. Barry picked up some surplus winter cycling clothing and then it was off to West Kirby for a spinning class. Things are slackening off before christmas as there are a few empty bikes. Aldi HRM threw it’s hand in in the class so no calorie counting. Not sure whether it is the strap or the watch. One first timer and another from Tina’s classes from the Oval that I haven’t done for over a year now. Hopefully she is starting up again in January. In case you don’t know Tina’s class was my first one, I didn’t know what I was letting my self in for but have never looked back. Classes were unusual in that they were in the dark. The mirrors may have something to do with it but they got steamed up anyway. I allways got a bike under the aircon as there were no fans. Wednesday: Northend ride. Spent most of the evening writing this post only to loose it. This was a day when only hardy souls and fools ride and I wonder which group I’d be put in. The problem is ice the gritted roads are Ok but side roads are lethal for anything on two wheels. I wheel the Iceni to Brimstage Road as it is icy underfoot. My front mudflap fell off by the Tudor Rose only for a car to run over it. The sun is low in the sky and it is a dangerous time to cycle on main roads. Side roads are out of bounds on a day like this too. The Northend rides are heading out soon after I arrive, the CTC are hanging back as they are off to the ICF for Christmas Dinner. Northend is next Wednesday. Saw lots today as there was time to take it all in, rode on my own as conditions meant a group was going to hit problems. You need to be well dressed for conditions like this, I’m in the Bioracer winter bibtights, a compression shirt (a bit like someones giving you a hug all day) and Steve Cummings’s Discovery Channel Winter training jacket. BBB winter gloves proved up to the job most of the day. It’s my decision to ride on my own as i consider group riding too risky in these conditions. It proves to be well founded. The A5117 upgrade is missing a few things like a cycle route in places, foreign lorries are getting pulled at the weighbridge. I’m trying to take an ice free route to the ICF, things are OK on the A roads that I don’t want to be on but off them things are dicy. I stop a Christleton to take a picture of the birds on the frozen ice, all this does is confirm how treacherous it is underfoot. There is one moment by the two bridges before the Ice Cream Farm but by enlarge it is incident free but not without taking a lot of care. Peter and three others are about to leave as I arrive and the CTC are waiting for their riders to arrive. The CTC have had a number of falls and Allan advises me that the route I want to take back is treacherous. I see the group on the way out and they warn me about the ice. Back to the Eureka via the A41, the Bike Factory ,Chester, the River Dee, Chester Racecourse and the Dee Cycle path. The Northend had a load of fallers on the ice, Barry came in with his yellow crane sport jacket muddied, he’s only had it a day. Cycled back home to take the mileage up to 50. No spinning class as I was messing around on the Xbox. Thursday: Turned up at West Kirby for the spinning class, sorted the bike out but Barbara is having trouble with the sound system. A lot of trouble. The maintenance guy gets called in and he can’t sort it. On of the girls from the class has a go but still no joy. Time passes and some of the class leave to get on with other things. You just can’t spin to no music it just doesn’t work. Finally I have a look, Barbara swapped over the audio lead to the amp and we were back in business. Well it was for four of us as that was what was left for the rest of the class. 25 minute class then the gym for weights. Ran the proverbial mile (1.6 km) at 10 km/hr which had me burning 142 calories which doesn’t seem a lot considering I was at about 90%. Thursday christmas shopping didn’t live up to what was promised. WallE on HD was good. Mags are full of Armstong on the Tour or training or anything, it’s silly seasion. Friday: It was a toss up between riding the Ventoux or riding around the Wirral in the cold and biting wind. Ride around the Wirral won but not before I had to fix a puncture from Wednesday. I felt quick today but it was only the wind behind me. Stopped at Morrisons and Vale Park, avoided the tacks on Telegraph Road by taking to the Road. All the phantom tacker has done is provided a load of repair work for the cycle shop in West Kirby. Called in at the bike shop in Moreton for patches and glue. You’ve got to wonder what the score is with the wind turbines. It blowing a gale down the Mersey and all the Bootle ones are parked. Out in Liverpool Bay it doesn’t look much better. It hasn’t been a good day for Garmin as both the 705 and the Forerunner50 start playing up.The 705 altimeter is going crazy showing daft elevtaion gains and gradients of 200% plus. The Forerunner 50 just kept reseting itself all the time. Back home it was time to clean the bike before putting it away for next Wednesdays Northend Cristmas dinner at the Ice Cream Farm. After faffing around the chain came off thanks to the split link and got a thorough clean and now a wax lube. The wetlube was attracting too much grit. 30 miles and before I sign off I did the Northend Freewheel down Resthill. As I can’t make the event I thought I’d see how I fared. Well I got 10 feet past a molehill by the edge of the road on the righthand side. Just past the watersplash if it rains. Saturday: Work. Only another 3 days of this and I’m off for 20 maybe more. Been in touch with Garmin about the Forerunner 50 strap problem. Sunday: Work. Was going to avoid Liverpool as it was hosting BBC Sports Personality of the Year and I thought it would be packed. The car radio traffic report had me hanging a U as the Runcorn bridge was blocked. Got in just in time to see the British Cycle Team ride down the ramp. Voted for Chris Hoy. 705 profile problem finally sorted thanks to Motionbased. Monday: Spinning class at West Kirby. Sounds like they had a good night at the party. Altered the seat height another notch higher. Gym afterwards, ran 0.5km usual weights then hit the shower. Picked up the BlueRay player from BlockBusters and set that up. Comes with 4 disks with two others from Sony. Work for a meeting about my future role. Home through the traffic, I was going to ride a Tacx dvd but it was getting on. Tried to play Hancock on the new player but it wouldn’t have it so I decided to update the software. Big mistake it takes ages and is up to 3 out of 9 while I write this. Might not get to watch a film at this rate. Bit of a poor show not being able to watch the films that come with it. Tuesday: West Kirby for a spin and the gym. Cut my nose shaving and it looked like I had a nosebleed when it opened up during the class. Upped the weights and would feelit later. The blue ray player final upgraded itself so we can finally watch Hancock. Tacx setup for another ride. Rode the Col de Azet and down the other side in an hour. Had a fan this time but it wasn’t big enough. It’s about 8% for most of it, cadence was about 80 rpm. Still got a climb to do but maybe another day. Now I could have done a spinning class but it wouldn’t have given the same sort of workout. Wednesday: Ride day cancelled due to ice. Treacherous conditions mean it’s not even worth thinking about. Went to the gym when I’d scraped the ice off two cars. I was slipping and sliding walking to them. Weight machines, crosstrainer for 15 mins. 2 Km row in 8:50.1 Santa run this Sunday but not for me as I’m in work. Treadmill for 5 km which went like this 1.6 km (proverbial mile)@ 9km/hr recovery 0.2 at 5, 1 km at 9 km 0.2 at 5, 0.8 at 9.0, 0.2 at 5 and the final km at 9 km/hr. Burnt 433 kcals. It’s about the length of the cross country run at school and I was hopeless at that always in the last 10. A couple more weights, shower then home. It’s still icy in the carpark where the sun hasn’t touched. Took things easy in the afternoon, read the Sunday times sorted the phone out. Lifestyle and Weight management followup class. A chance to meet another group going through the same course, these are four weeks into the first twelve weeks. There is a bit of scepticision about the exercise but that is what makes it a winner over dieting alone. We’ll see who makes to the next one on 14 Jan 09. Thursday: Trip to the gym if I’m not snowed in. Last day off, make the most it. Maybe sort the CV out. Half empty spinning class at West Kirby with a lot cancelling. Gym afterwards. Did 5 km on the rowing machine this took 24 minutes 50 seconds but only burnt 274 kcals which is exactly a Mars bar. It seemed like a lot of effort. Ordered two Tacx DVDs and did a 50 minute training session on the I magic. Nothing too hard I thought maximum gradient is Only 3%. A few minutes in and I was wondering what it was going to throw at me next. Sweats pouring out of every pore of my body, forgot to switch the fan on, not that it does any good. 667 Kcals in 50 minutes at an average of 232 watts (max 505) Heartrate max of 172 which is getting near to my max. I’ll have to come up with some shorter ones as some of these look hard with a capital H.
Friday: Work. No spin no gym, its a long day in a place you don’t want to be in. Saturday: Work. Two Tacx DVD’s arrived from Chain Reaction Cycles which was a really quick turn around. Finally got to watch Mama Mia, good to watch something good and something I’ve lived through for a change. Sunday: Work. Only one shift left but no early darts to the gym these days. Top gear when I got in.